The Official website of D.B. (Don) Keele, Jr.
CBT "Goodies" Zip Download! Just Added: LIne Array Shoot-out! What's wrong with this speaker! Why is it bent backwards? 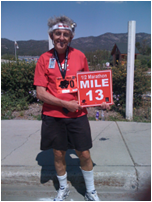 “Run the Bear” Half Marathon, Sept. 12, 2009. Big Bear Lake, CA. Last year I did 28 competitive events including five half marathons, a triathlon, and a 38 floor stair climb. Pretty good for a 69 year old! D. Broadus Keele, Jr., was born in Los Angeles, California, on Nov. 2, 1940. After serving in the U. S. Air Force for four years as an aircraft electronics navigation equipment technician, he attended California State Polytechnic University at Pomona, where he graduated with honors and B.S. degrees in both electrical engineering and physics. Mr. Keele worked as an audio systems engineer for Brigham Young University in Provo, Utah from 1969 to 1972, where he received his M.S. degree in electrical engineering in 1975 with a minor in acoustics. 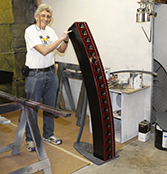 From 1972 to 1976, Mr. Keele was with Electro-Voice, Inc. in Buchanan, Michigan, as a senior design engineer in loudspeakers, concentrating on high-frequency horns and low-frequency vented-box loudspeaker systems. He is the primary designer of their "HR" series of constant directivity horns on which he holds the patent. 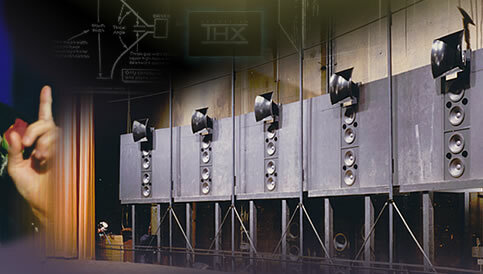 For one year, starting in 1976, he worked for Klipsch and Associates in Hope, Arkansas, as chief engineer involved in the company's commercial line of loudspeakers. From 1977 to 1984, he was with JBL, Inc, in Northridge, California, as a senior transducer engineer working on horn and monitor loudspeaker system design. He also holds two patents on JBL's "Bi-Radial" series of constant directivity horns. 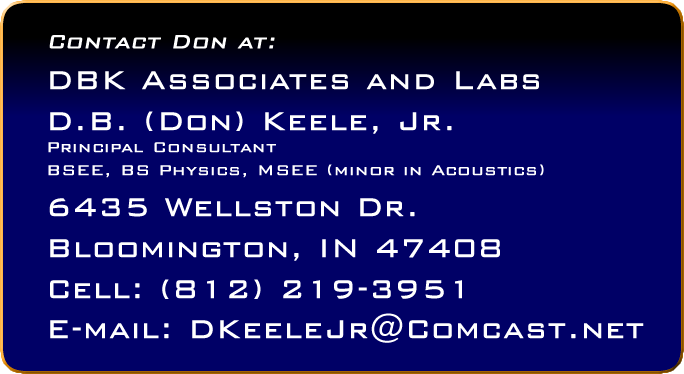 Mr. Keele was employed by the Techron Division, Crown International, Elkhart, Indiana from 1984 to 1989, where he was Manager of Software Development and responsible for the TEF System 12 Time Delay Spectrometry Analyzer software. While at Techron, he was the designer/programmer for two software packages for the TEF System: EasyTEF, a program for doing general-purpose TDS measurements; and TEF-STI, a program for measuring speech intelligibility. From 1989 to 2000, he operated his own consulting company, DBK Associates, working primarily for Audio Magazine, Hachette-Filipacchi Magazines, Inc., as their Senior Editor in charge of loudspeaker reviews where he wrote over 100 loudspeaker review articles. In 1996, he rejoined Electro-Voice, Div. of Telex Communications, as a Senior Research Engineer. In 2000, he joined Harman/Becker Automotive Systems, Martinsville, Indiana, as a Principal engineer in the advanced technology development group where he shared an office with Richard Small (of Thiele-Small loudspeaker parameters fame). At Harman/Becker he added three more patents to his portfolio with two more pending. In November 2008 he lost his job with Harman-Becker when the plant was closed. Since then, he has resurrected his consulting company, now called DBK Associates and Labs, where he is the principal consultant specializing in loudspeaker horn design, loudspeaker array design, scientific programming, and simulations. 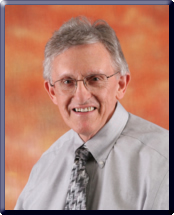 For the last ten years he has been an ardent advocate and evangelist for the CBT arrays, which he invented, and believes the CBT know-how, can vastly improve the sound field uniformity of existing line arrays and loudspeaker systems. He has presented and published over 35 technical papers on loudspeaker design and measurement methods and other related topics, among them the paper for which he won the AES Publication Award, "Low-Frequency Loudspeaker Assessment by Nearfield Sound-Pressure Measurement". He is a frequent speaker at AES section meetings and workshops, has chaired several AES technical paper sessions, and is a member of the AES review board. Mr. Keele is a past member of the AES Board of Governors and is past Vice President, Central Region USA/Canada of the AES. He is a fellow of the Audio Engineering Society (AES) and a member of the Acoustical Society of America (ASA). Mr. Keele received the 2001 TEF Richard C. Heyser Award for contributions to loudspeaker measurements. In 2002 he received a Scientific and Technical Academy Award from the Academy of Motion Picture Arts and Sciences for work he did on Cinema constant-directivity loudspeaker systems and is listed in the AES Audio Timeline where he pioneered the design of constant-directivity high-frequency horns in 1974. Mr. Keele has been married for 41 years, has four children, six grand children, and resides in Bloomington, Indiana, USA (as of July 2010). Note that one has to respect the copyright and to ask permission to the copyright owner if one wants to print or use a paper.